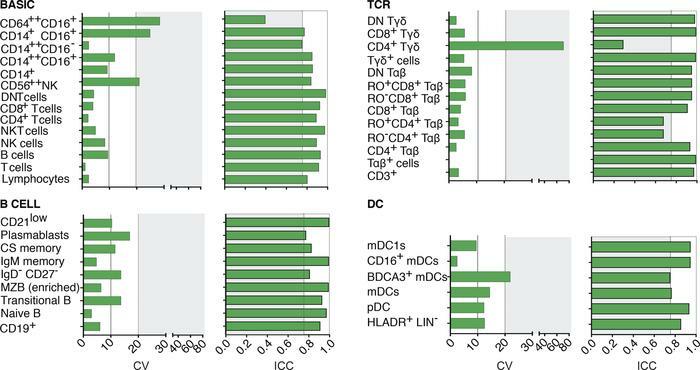 Inter-center comparison of populations quantified in cryopreserved PBMCs from healthy subjects with the Basic, TCR, B cell, or DC panels. Replicate aliquots of cryopreserved PBMCs from 5 subjects were analyzed at 5 different sites using the indicated DuraClone panels. Raw data (LMD files) were analyzed centrally, and the reproducibility of population proportions was determined by statistical analysis. All calculations were based on the cell proportion relative to the parent gate; the identity of parent gates for all variables is listed in Supplemental Table 1. Shown are CV and ICC values for each population. CV and ICC values indicative of poor reproducibly (i.e., CV >20% and/or ICC <0.75) are shaded in gray. CS memory, class-switched memory; DNT cells, double-negative T cells; mDCs, myeloid DCs; MZB, marginal zone B cells; pDCs, plasmacytoid DCs; RO, CD45RO.